Cyclocross is perhaps the most accessible and enjoyable forms of cyclesport. Traditionally an autumn and winter sport, it's roots are unclear but it's a major sport in some European countries and currently enjoying a boom in the USA. Races are fast, furious and muddy. Normally lasting around hour, a typical race will take short laps of singletrack, grass, tarmac and hurdles or a short running section. Although less technical than XC mountain biking, the courses used in the Scottish series are a stern test of rider's abilities. The courses tend to favour cyclocross bikes, but many racers ride mountain bikes and these are welcome at all SCX rounds, including the championships. 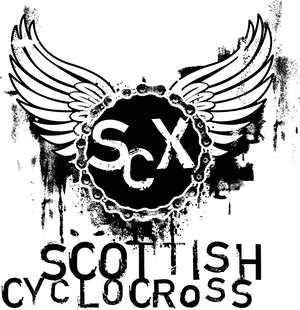 CX is a new idea for me, but might give it a shot this winter, glenmore and Mull anyway. What's the craic? Do i whip the racks and cages off my pretty crap, pretty heavy touring rocky mountain sherpa, or am i better on the superbling trek elite 9.9ssl mountain bike (maybe with narrower tyres?) Will you all laugh at me if I turn up on a mountain bike - it seems a bit out of the spirit, but I bet it is faster. The courses do favour CX bikes and most races in recent years have been won on traditional CX (or flat barred CX) bikes. Look forward to seeing you on the start line. CX new to me too, but planning a few of this winter's venues for sure. Talking of using silly bikes - will I be able to fit standard CX tyres to my 29er MTB rims? Otherwise, I think the narrowest MTB tryres I'll find will be 1.5s. Bought a crosser this year and fancy at least one race (did one years ago on a old 36lbs MTB and suffered!). Still unsure about actually using my 'dale crosser - I reckon it must be faster on my regular MTB hardtail with mud tyres?, I know I may get more respect on the crosser but to be honest I have never taken it onto dirt and reckon a race may be a bad idea to try it out!